Written with Joe Connolly, Regional Vice President of Marketing and Communications, Trinity Health Of New England. Trinity Health Of New England has created a multi-tiered approach to connecting physicians to health system priorities, consumers and each other. The formation of the health system in 2013 brought together over 800 employed doctors with 1,500 affiliated physicians from 11 previously autonomous practices, all of whom needed to be integrated into one new medical group. "Our goal was to take advantage of regional resources and capabilities, and build referrals within the regional provider network," said Joe Connolly, regional vice president, marketing and communications at Trinity Health Of New England. "Yet many physicians told us they didn't know who their new colleagues were, and who they should be referring to." It was clear that the Trinity team needed to create greater awareness and foster cohesive relationships between referring providers. Foundation: At this stage, the region focused on strategic plan alignment, market readiness and messaging consistency with all physicians. Consensus (buy-in and inclusion): A second critical step was ensuring that key physician practice groups, business and clinical leadership and employed medical staff were on board with system goals. Connections: The team looked at the communications opportunities it already had, such as medical staff meetings and consumer events, to help physicians build connections with other doctors and with consumers. Outreach: Connolly and his team took a hard look at existing communications vehicles to evaluate what worked and what did not. "We had print magazines and newsletters, but they weren't coordinated in their focus and messaging," Connolly said. The team opted to utilize a digital, multi-tiered approach in order to leverage data-driven insights to improve physician engagement and alignment. That meant creating new materials that employed email, social media and a microsite. The New England team worked with Relevate Health Group to develop a contemporary messaging and content strategy based on the type of information providers value most. Not surprisingly, it varied by specialty and setting. "Your provider community is not a monolithic community. Surgeons are very different from family practitioners, who in turn are totally distinct from clinical specialists, researchers or teaching faculty," said Bruce Kennedy, executive practice leader at Relevate Health Group. Armed with fresh insights, the team created three digital publications with complementary messaging targeted to different audiences. Colleagues in Caring: A quarterly e-newsletter from the chief physician executive discussing strategic business development and operational and clinical issues. The newsletter is distributed by email to all medical staff in the region. In The Loop: A monthly email from the president of the owned medical group to employed physicians detailing organizational strategies and key issues. 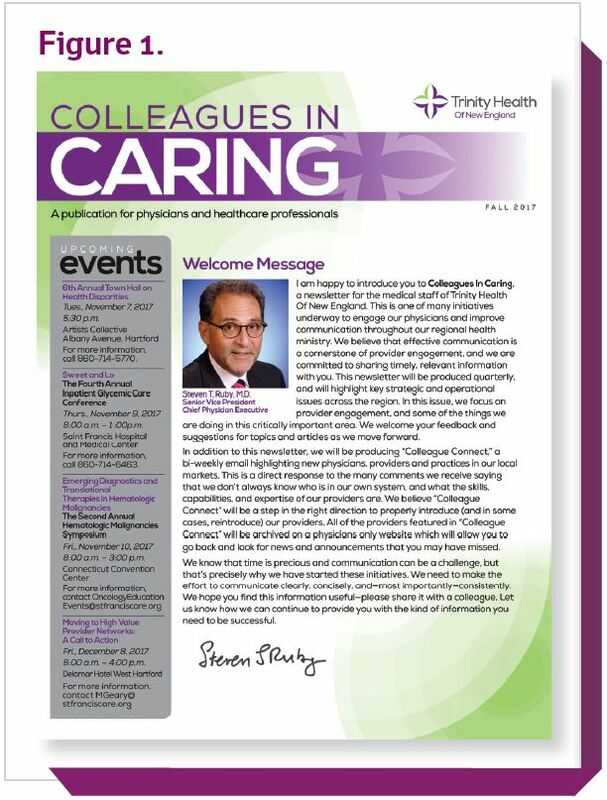 Colleague Connect: A quarterly email from the chief physician executive that introduces newly credentialed providers and spotlights a physician of the month. The email is also distributed to all medical staff in the region. In addition, the team created the Colleagues in Caring microsite to provide additional details on the articles in the digital publications if physicians want a deeper dive into subjects. Each of these communications vehicles have been well received by physicians and have generated strong results for the health system.